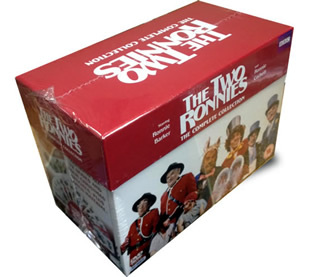 The Two Ronnies complete collection DVD set. All 12 series from start to finish, 4 Christmas specials, plus loads of bonus materials on 27 DVD's of this classic british comedy. DELIVERED FREE IN THE UK. The Two Ronnies complete series set contains every one of the 93 full classic episodes made. From 1971 to 1987 Ronnie Barker and Ronnie Corbett made one of the most popular comedy shows ever. Ronnie Barker and Ronnie Corbett star in this one of the BBC's best ever classic sketch show comedies, these guys really are classics! Starting in 1971 and running to 1987 the pair are all time greats. You really no not get comedy like this now days. Just released for Christmas 2012 this set is a must have. For more background information on the Two Ronnies check the BBC site here. 27 DVD's box set delivered to your door. We are still in the process of viewing the box set we purchased but so far we are very satisfied with the quality of the discs we have seen. 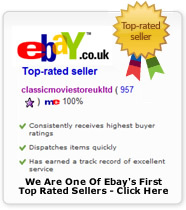 Excellent store to purchase from, with great prices and fast delivery. I recall how much I enjoyed watching The Two Ronnies when the series was originally first shown on television. I was pleased to see a boxed set of the complete series offered for sale by Classic Movie Store at such a competitive price. Delighted with my purchase. The Two Ronnies Fork Handles sketch is an all time classic.